16 1/8 by 21 5/8 in. Everything that is painted directly and on the spot has always a strength, a power, a vivacity of touch which one cannot recover in the studio... three strokes of a brush in front of nature are worth more than two days of work at the easel. 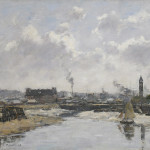 Boudin has painted a winter morning in Trouville, the harbor showing evidence of a recent snowfall. 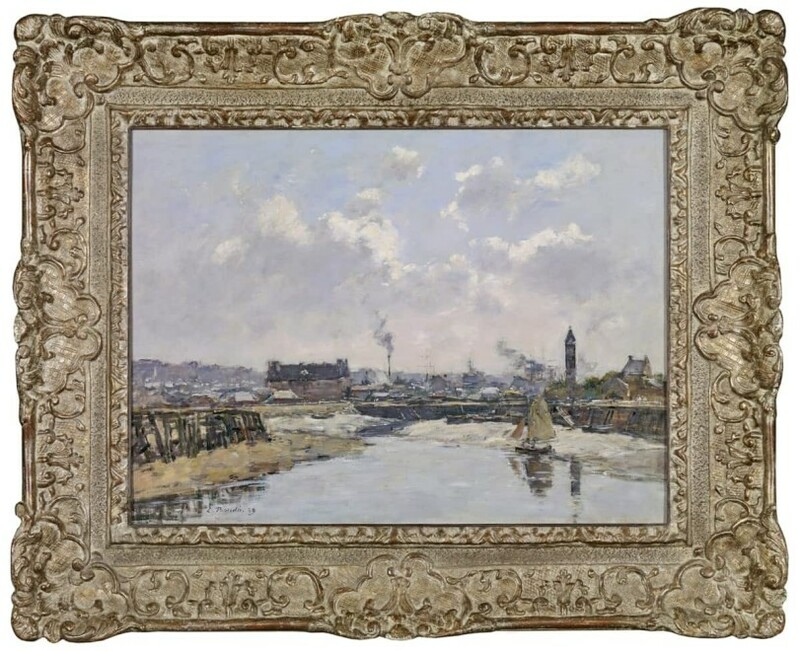 The changing seasons along the Normandy Coast provided varying tableaus for the plein air painters, who called this region home on-and-off during the second half of the 19th century. 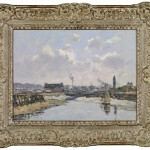 For Eugène Boudin, who was born here, the Channel coast with its waters and skies held great personal significance. He had known the region before tourism arrived; before fishing cottages were replaced by bathing cabanas, restaurants and hotels. Yet, when we think of Boudin’s most memorable paintings, what immediately comes to mind are his beach scenes crowded with fashionable vacationers, or his crinolines. While he may have enjoyed the greater variation in color on his palette that these pictures required, it is likely with mixed feelings that Boudin painted these subjects. He wrote to a friend that these beach crowds seemed like “a frightful masquerade.” Thankfully for him, he still recognized that “the Creator [had] spread out everywhere his splendid and warming light, and it is less this society that we reproduce than the element which envelops it.” (quoted in Robert Herbert, Impressionism: Art. Leisure & Parisian Society, New Haven, 1988, p. 268). 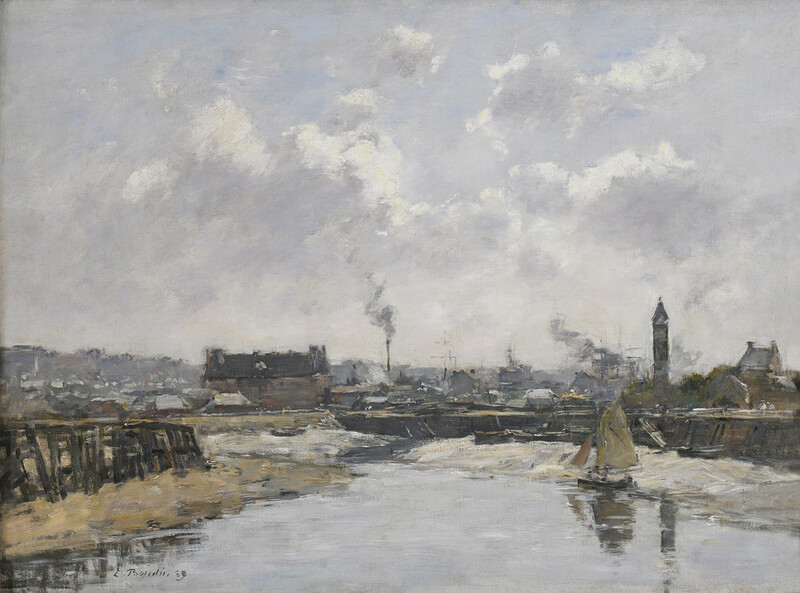 Boudin was awarded a gold medal at the 1889 Exposition Universelle, the year of our painting. 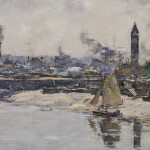 He also had recently garnered success in selling some of his paintings to the French State. 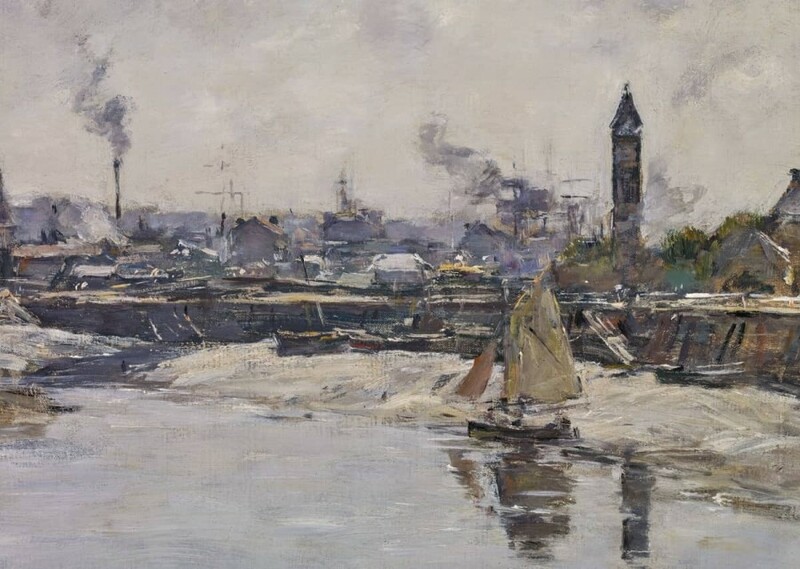 But, even in the last decade of his career, he continued to be drawn back to his native Trouville, where in his trademark palette of greys and blues, he painted the harbor and the features of village life he had remembered as a young artist. The first owner of our painting was the well-known French playwright, Georges Fedeau, who was married to the daughter of the painter, Carolus-Duran.